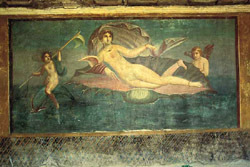 The fresco of "Venus in the shell"
The focal point of this house is the peristyle, which is sumptuously decorated with painted garden features (fountains, hedges, birds, flowers, sculptures). The most impressive painting of all is on the rear wall: it portrays a naked Venus with a head of curly hair and resplendent with gold jewels, sailing in a shell with billowing sails accompanied by a retinue of cupids. From an artistic point of view the painting is of poor quality, but its colours are well arranged and the overall effect is highly dramatic.